This herb is not the garden strawberry. It is a bush 3-6 ft tall with flowers that are greenish-purple. Erect or straggling, deciduous or nearly evergreen shrub. Stalks are green, 4-angled. Leaves rather thick, lustrous, sessile; tips sharp-pointed. Flowers greenish purple; petals stalked. Flowers in May to June. Fruits scarlet, warty. Do not look like garden strawberry fruit. 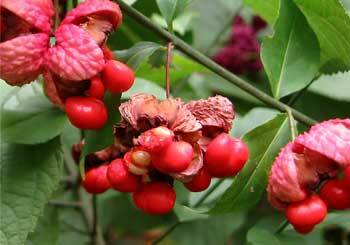 Strawberry bush (Euonymus americanus) is a related plant to wahoo (Euonymus atropurpureus). Medicinally strawberry bush is equivalent to wahoo. Rich woods. Southeastern New York, Pennsylvania to Florida; Texas, Oklahoma to Illinois. Native Americans used root tea for uterine prolapse, vomiting of blood, stomachaches, painful urination, wash for swellings. Bark formerly used by physicians as tonic, laxative, diuretic, and expectorant. Tea used for malaria, indigestion, liver congestion, constipation, lung afflictions. Powdered bark applied to the scalp was thought to eliminate dandruff. Seeds are strongly laxative. Fruit, seeds, and bark may be poisonous. Do not ingest. Fruits may cause vomiting, diarrhea, and unconsciousness.